Cue the marching band! Bring out the dancing girls! 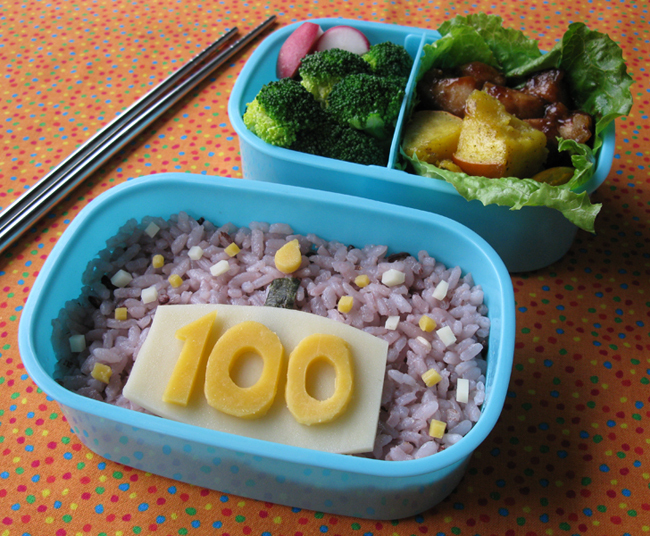 Today marks my 100th Bento Blog Post! I am so happy to share this milestone with you. I started on this fun bento journey in April this year after spying some amazing bentos created by Sheri of Happy Little Bento online. I wanted to try bento lunches for myself, and incorporate the wonderful produce and artisan foods of Sonoma County. So far, I have made some great friends, learned new recipes, found a great outlet for my creative nature, and donated to the Redwood Empire Food Bank to help the hungry in my community. For every bento blog post on Sonoma Bento, I donate $1 to my local food bank. I was inspired by Susan Yuen of Hawai'i's Bento Box after I saw how she donates to her local food bank. We are so lucky to be able to create nutritious and cute lunches with a variety of delicious and seasonal foods. It is important to me to remember that not everyone has this same luxury. I encourage you to find a way to give back as well. You can donate to Redwood Empire Food Bank online, or choose to help the hungry and less fortunate in your own community. Woohoo! In this bento: purple rice (naturally colored-it's a mix of Purple Forbidden Rice blend and white sushi rice cooked together) with a provolone and cheddar cheese 'cake' and nori and cheese candle, plus cheese 'confetti'. In the upper compartment: steamed broccoli, a radish, glazed mochiko chicken pieces, and roasted acorn squash from Ma and Pa's Garden. To celebrate my 100th bento blog post (and coincidentally I also made it to 20,000 hits on my blog today!) I am giving away some cool stuff. You can win this cutie bento box plus the Angry Onigiri Bento Box Strap (made by me)! (The box in this photo is my bento box, but you will win an identical, brand new one.) 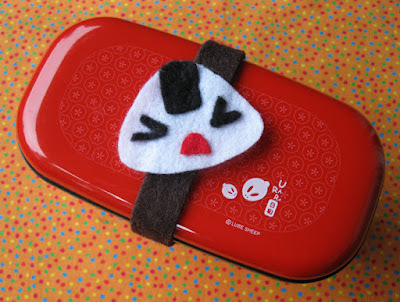 See more cute bento box straps in my online etsy shop here. 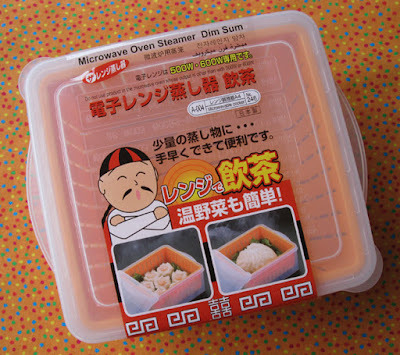 One of my favorite bento making tools is my microwave steamer. I use it all the time for broccoli, edamame, dim sum, and other items that need to be steamed quickly. You will win this brand new one! 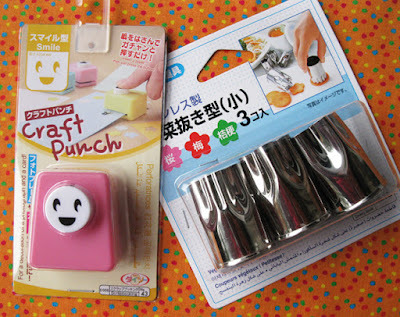 You will also win this craft punch to make cute faces from nori, and a set of three veggie cutters. 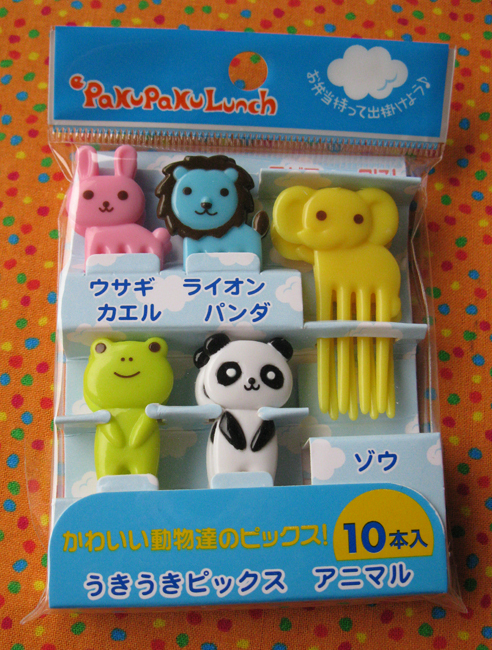 Here are some darling animal shaped picks that you will win, to make your bento box lunch very kawaii! 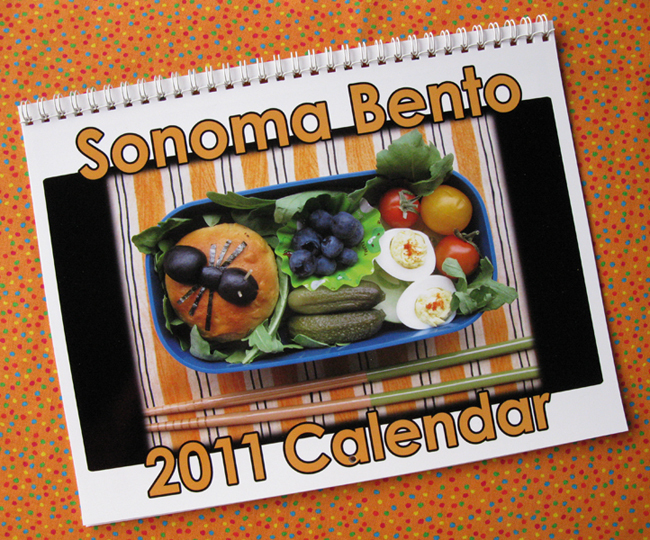 And last but not least, your very own copy of my Sonoma Bento 2011 Calendar! It's filled with adorable bento box photos along with monthly tips for making cute and nutritious bento lunches. You can order your own copy at zazzle.com to send to friends! So how do you win this amazing pile of goodies?!? Glad you asked. There are a few ways to enter, so please read the directions carefully. This contest is open to EVERYONE. Please leave a separate comment for each entry. GOOD LUCK and thanks so much for following my bento adventures. 1. This part is Mandatory. You MUST be a follower of my blog. To follow my blog, simply click the Follow with Google Friend Connect button on the right side of this page, or click the Follow link located at the upper left corner of the blog. Leave a comment telling me that you follow the blog and what your Google ID or Blogger ID is. 2. Mention this giveaway on your own blog or twitter account for a second chance to win. Just post a comment here with a link to where you mentioned my contest. 3. 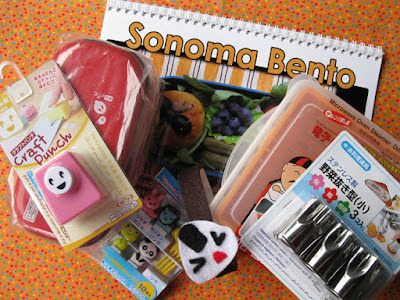 Follow Sonoma Bento on twitter. Leave a comment to let me know that you follow me on twitter. 4. 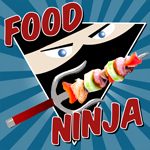 Follow Sonoma Bento on facebook. Leave a comment to let me know that you follow me on facebook. 5. For a final chance to win, leave a comment here telling what winter foods you like to pack into your lunches. Please leave separate comments for each of your entries. Entry deadline is Sunday, December 19th, 2010 at 11:59pm PST. Winner will be selected randomly from entries. Good luck! 5. Winter foods? HUGE fan of all "Cucurbita", or squash. Spaghetti squash, pumpkin, zucchini, butternut and acorn squash...Yum. I also love creams of any kind - spinach, cauliflower, carrot, broccoli, etc. And last but not least, any of the usual Christmas dinner items - turkey, sweet potatoes, cranberry sauce, mashed potatoes.....I'm really hungry now. LOL! Congrats on creating so many beautiful, seasonal and local bentos and so many smiles along the way, SB! Awesome giveaway! I love following your blog...some of my fav winter bento items are squash, mushrooms and dark leafy greens of all kinds. The winter food I like to pack into my bentos are soup stuff (to keep me warm), noodles, jook, and corn chowder. mmMmm yum! @liacreates is your newest twitter follower! And finally... I love any kind of squash. Winter food is all about comfort so some nice pumpkin or spaghetti squash totally hits the spot! Awww, (*tearing up*) Sonoma Bento reaches 100! So happy and proud of you!! You have reached out to the community and shared bento love with those around you, which shows the good heart you have. We are fortunate to have you in the bento community and are enriched by the organic and local focus you share with us in your bento and your blog. First time visitor on your blog. I found you through a search I have that has the word Sonoma Blog in it. I'm also a Sonoma County blogger. I have a thrift blog and a food blog. I'll make sure to add you to both of my blog rolls. My favorite winter foods is a thermos of brown rice and tamari sauce. With that I love a nice kale salad with Annie's ginger dressing. I love your bentos- especially how you incorporate so many fresh ingredients. I live in an area where we are lucky to have so many farms providing fresh foods and it's depressing to watch all the families buying overly-processed foods for their lunches when they could easily buy local produce that tastes twice as good! I'm also a facebook follower! And my favorite winter foods to pack- I mostly make bentos for my children, so I love to pack small treats for them. We don't do a lot of candy at our house, so it's nice to hide a mini-candy cane under a sandwich or give them a mini-pot pie from my freezer stash. For my husband, I love to pack stews and donburis. Hello! I love this giveaway. 6. In winter I really love to put mini candy-canes in my bento. I also love to cut whole-wheat sandwiches (the whole wheat is to get a gingerbread looking color) with cookie cutters like angels and gingerbread men. I followed you through GFC, username is Bhevarri! I followed you on Twitter, my name there is Bhevarri! I am a follower of the blog and have my fingers crossed....... I can't buy bento stuff where I live so this would be awesome!!! And finally - I love using winter squash in my bentos. I also love love love ochazuke! So delicious and warm! for winter bentos I enjoy packing more candy and treats for my daughter. It's really the only time I do. Congratulations!!! I am totally a Sonoma Bento devotee! I'm a follower too, lol! This is incredible! Happy 100th!! I admire your tenacity and creativity. Here's to 100 more! I'm a follower of your blog! My Google ID is Alice Wang! I'm also following you on Twitter! My Twitter handle is Alicelily. You know I'm a follower! If I followed any more closely, I'd be a stalker. Winter is all about the pumpkin and/or sweet potatoes. Barely a day goes by that I don't have one or the other. Dish I'm taking to tonight's neighborhood party: pumpkin enchilada casserole. As you know, I am a follower of your Blog, my ID is Ty. Congratulations, Michelle :D! Here's to lots of bentos to come! I've been a follower for a while - my Google ID is sternenblumen :). I'm also following on Twitter (as Flowerstar) ^^. And on Facebook as well! And I posted about your giveaway here. Last: My favourite winter food to put in my bento are citrus fruit - oranges and tangerines! I love them, and they look so pretty in my bentos ^^. For winter foods, I love meatballs and rice (sweet & sour or Swedish, not with red sauce). Or soups. I'm a huge winter-soup person. My mom promised me pea soup the night we get to Canada. I follow your blog! btw, your cheese confetti is GENIUS! 1. I follow your blog via the RSS-Feed on Dreamwidth. You can see me as a subscriber on Dreamwidth info page on the feed ( http://sonomabento-feed.dreamwidth.org/profile ) or the sonomabento-feed in the Feed-subscription part of my own profile page ( http://martyna.dreamwidth.org/profile ). 3. No twitter for me. Don't own. 4. I follow on FB. Same name as my nick and then with W.
Hello Sonoma^^ Congratiulations on your 100th post! Uhm.. and I don't know what winter vegetables I'll be putting in my bento the next month - I'm taking whats at home (which means, what my parents are buying). But I connect mandarins to winter, and I love to take one or two (or more XD) with me to university (even if I'm not making a bento). And I'm thinking about a bento with curly kale and bregenwurst. I follow you on twitter! (Bentonono) And I'm posting your giveaway in a few minutes! And something I'll ALWAYS love to eat during winter time is ICECREAM! It may sounds weird, but I really enjoy having Icecream when it's cold! Pretty sweet rewards! I'm following. Oops. My blogger account is in my name. I have also followed you on Twitter. Added you to my facebook! I retwitted your message. Hope you get more people to join! And last entry, my favorite thing to pack is mashed potatoes. They get all warm and cozy, especially with some cheese mixed in. That's the kind of food I want when it's snowing/windy/20 degrees F outside! ATM I totally love to eat sweet potatoes but it could change everytime. 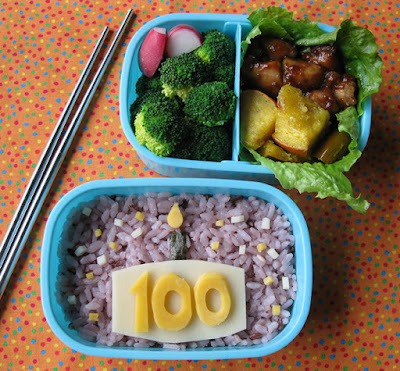 Congratulations on your 100th Bento Blog post!! I'm a follower through google, anita7601. I'm a follower - ckruest! My favourite winter foods are squash and certain seasonings. makes everything taste like christmas! Congrats! 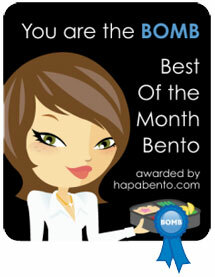 You're a positive force in our bento community and I appreciate the bento-love you share and the focus on local foods. I am a new follower! Great giveaway! I love to pack leftovers. They seem to work for my busy family all year long. I'm new to bento, but I love cabbage salads, sauerkraut, sausages etc., so I imagine that alot of those will get packed. Also, who could beat a nice winter salad? First of all congratulation for 100th post and i am your new follower. This blogs really interesting.